EVERETT, Wash., March 21, 2018 – Snohomish County Parks has closed 2.6 miles of the Whitehorse Regional Trail indefinitely due to significant earth movement. 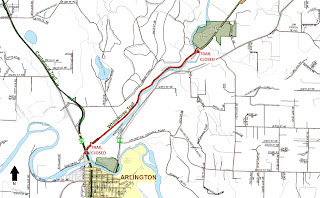 The trail will be closed between the juncture of the Centennial Trail in Arlington to Trafton. The trail was scheduled to be resurfaced and officially opened this fall. Because of the slide, Parks will redirect the resurfacing funds to a different section of trail. Parks staff will be working closely with Snohomish County Public Works geogoligists to assess the earth movement. We will also work to identify funds for civil engineering and construction to repair and reinforce approximately 1,400 feet of trail and embankment. While this section of trail has been officially closed for years, many have been using this segment. Any users of this section of the trail are putting themselves and their companions at risk. For detailed questions, contact Amy Lucas at 425-388-6620 or James Yap 425-388-6610.